When the iPad was first rumored to be launching news media companies were all failing over themselves to rush out and get apps made for the new platform because they were being told that this was how they could start making money, unlike the uncouth web users at large who want everything for free. Everyone from Murdoch to wired hoped on the iPad app bandwagon with the hope that the money would come rolling in and they could continue to believe in the illusion that their business model didn’t need to change. 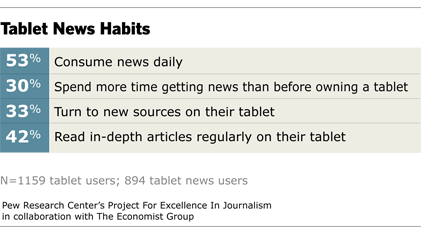 Well it turns out that this may not be the case if a new study from the Pew Research Center’s Project for Excellence in Journalism; in collaboration with The Economist Group, which found that while 21% of tablet users would be willing to spend $5.00 per month if that was the only way to get their new the majority are not willing to pay anything. When it comes to ownership, many see the tablet computer as more of a household device to share than a strictly personal one.